DVF 2000 is a mini fixed-wing unmanned aerial vehicle (UAV). Image: courtesy of SURVEY Copter. The DVF 2000 UAV can carry a maximum payload of 1.1kg. Image: courtesy of Airbus Defence and Space. The UAV can be recovered aboard vessels using a net recovery system. Image is in the public domain. The DVF 2000 is a fixed-wing, short-range mini unmanned aerial vehicle (UAV) manufactured by SURVEY Copter, a subsidiary of Airbus Group. DVF 2000 delivers high performance in land, coastal and naval missions. The UAV can be deployed in military and civil applications, including intelligence, surveillance, reconnaissance and targeting (ISRT), protection or monitoring missions, search and rescue (SAR), monitoring of power lines and pipelines, convoy, VIP protection and border surveillance. DVF 2000 is currently operated by a large number of armed and special forces worldwide. The Lebanese Air Force is expected to receive DVF 2000 UAVs under a DONAS contract signed between the Kingdom of Saudi Arabia and France in November 2014. "DVF 2000 is currently operated by a large number of armed and special forces worldwide." The fixed-wing UAV integrates an autopilot, a data link, and a mission payload section. Its modular design allows for the development of a vertical turret (VT) version, which includes a gyro-stabilised turret in a vertical position. The UAV is powered by an electric motor driving a single propeller. 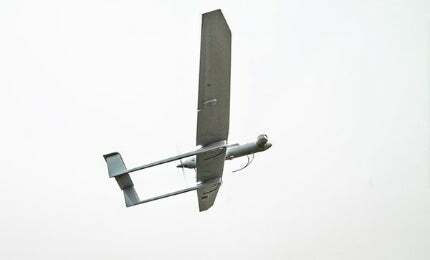 The DVF 2000 UAV has a length of 1.2m and wingspan of 3m. It has a maximum take-off weight of 11kg and can carry a maximum payload of 1.1kg. Plug-and-play architecture of the DVF 2000 enables quick integration of custom payloads. The UAV is fitted with a gimbal housing electro-optic (EO) / infrared (IR) cameras. The gyro-stabilised gimbal minimises the impact caused by the aircraft motion and allows the operator to steadily focus on a target or object of interest. DVF 2000 is compatible with CARD Eyes VI or IR / T110 Visair or VI payloads, which provides real-time video and imagery during day or night missions. The UAV carries lithium polymer (LiPo) batteries to supply power to the payload. The Harfang system, made up of three aerial vehicles and two ground stations, is in use by the French Air Force. The UAV is launched from the surface or deck of a vessel using a catapult launcher, and can be recovered using a net landing system. It is also fitted with skids for supporting landing on hard surfaces. DVF 2000 is fully autonomous and follows a flight plan set by the operator before or during flight. The real-time automatic 3D waypoint management system ensures autonomous guidance of the UAV. The unmanned air vehicle is also controlled manually by the operator using a ground control station (GCS). The GCS integrates two personal computers (PCs) and control units with joysticks. The PCs allow the preparation and supervision of missions in real-time and enable the operator to view and record the real-time imagery captured by the UAV. Joysticks are used to alter the flight trajectory of the UAV with high-level commands and control the gimbal and the payload. The GCS is linked to a TLD or TLD LP data link antenna for tracking the UAV in real-time. The ground station with single or dual workstations offers superior ergonomics and man-machine interface. Its user-friendly design ensures seamless transfer of real-time videos and data by onboard sensors. The GCS can be installed in a vessel, trailer, car or truck for mobile missions. The unmanned aircraft can attain a maximum speed of 100km/h and a range between 10km and 50km. The electrically powered DVF 2000 standard version offers flight endurance of two hours. The mini UAV has a cruise altitude of 150m and can reach a maximum altitude of 2,500m. It can be deployed in less than ten minutes and can operate in temperatures ranging between 0°C and 50°C.